#1 New York Times bestselling author Johanna Lindsey's "mastery of historical romance" (Entertainment Weekly) takes center stage in her eagerly anticipated new novel of the aristocratic Malory family -- a passionate, witty, and high-spirited tale that provides startling new information about a prominent member of the family. After her mother died, vivacious Katey Tyler fled her dull Connecticut town, hoping to meet her relatives in England and find adventure and romance on a grand tour of Europe. She had no idea that her life-changing travels would have both in spades -- as well as danger and intrigue -- when she catches the eye of ship owner Boyd Anderson and inadvertently stumbles upon a high-stakes kidnapping. When Sir Anthony Malory's young daughter is abducted from London's Hyde Park, her kidnapper mistakenly sends the ransom note to the home of Sir Anthony's brother, James. With James and his wife, Georgina, in the Caribbean, the demands are received by their houseguest -- Georgina's youngest brother, Boyd Anderson. Searching for the girl with Anthony, the notoriously hot-headed American sea captain fully intends to make the foolhardy villain pay. But he hardly expects to find exquisite Katey Tyler, recently a passenger on his ship, at the center of the plot! Little does Katey realize that in having caught the attention of Boyd Anderson -- and in meeting up with the Malorys -- she's about to experience more excitement than the typical young lady encounters on a grand tour, and her life will never be dull again. A multitude of surprises await Katey, from the startling truth about her mother's early life to the lengths a man will go to win the affections of a lady who has every reason to despise him -- but who can't resist the seductive, impassioned love he has to offer her. 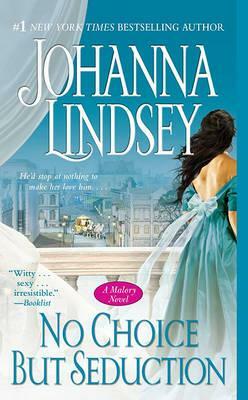 With the delightful humor, lovable characters, and tempestuous passions that have placed Johanna Lindsey's eight previous Malory novels among the best-loved and most widely read romantic novels of our time, No Choice But Seduction sweeps readers away on an irresistible adventure that is as bold and charming as the heroine at its heart.